Here's another review after MIA for awhile. As promised, I'll be reviewing the stuffs I bought at Etude House SM Cebu branch a couple of months ago. 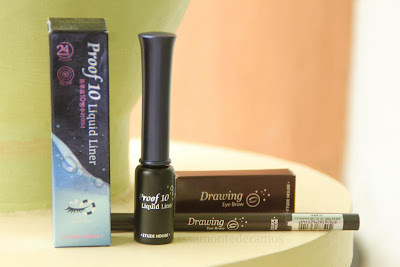 So I bought the Proof 10 Liquid Liner just to try my luck from it. I am a gel liner user for 2 years already and I thought I was satisfied with it. Not when I first tried the EH Proof 10 liquid liner. It was love at first try (if there's such saying! ), seriously I felt instantly inlove on how the brush tip glides easily on my eyelids. I can make a winged - eye look easily because of it's fine tip. It's size is just perfect when using and bringing anywhere even in your small pouch. True to its claim, it is waterproof. It doesn't smudge easily nor crack. Once it's applied, it dries fast that you don't even have to wait that long to apply another coat or mascara. I, myself have oily lids so wearing this liquid liner was never a problem. This is now my favorite liquid liner so far. On the other hand, Etude House' Drawing Eyebrow is another favorite. I can fill in sparse areas of my eyebrows without looking like an old - lady - with - a - tattoo-ed - eyebrow. Haha. Honestly, it's just the right shade of brown (I got #2) which looks natural when applied. This is easier to bring around your make-up kit because it's retractable and you don't need to bring all the time a sharpener unlike other eyebrow pencils. The other end actually has a spoolie brush which you can use to tame unwanted hairs before or after. What's great is that it cost only 178 pesos if I remember correctly and it's refillable as well. I'm actually on my second refill now because I love it so much. On a lighter note, I've read good reviews of Dolly Wink liquid eyeliner and Majolica Majorca, I might try one of these soon. How about you, what's your favorite eyeliner so far? I have not tried this etude house liner yet. Im still listing stuffs to buy on my next trip to their shop. Hopefully I can get to try this proof 10 type of their liner soon.